Imagine!! | It's All About Life Long Learning! Reading Recovery® has been wrongly branded as a ‘program’ for students that are struggling. Having recently returned from a Canadian Institute of Reading Recovery® Annual General Meeting, and having rich discussion with other Canadian Reading Recovery Administrators and Teacher Trainers, it has become apparent that to understand the impact that Reading Recovery has for struggling readers we CANNOT continue to refer to it as a program. “Program” has the connotation that there are consumable resources. Reading Recovery does not come with such. Rather the expense is in the human resources. What makes the difference in this “intervention” is the training that the teachers receive. The strength in this is the fact that the training is ongoing, constantly being improved upon, as long as the teacher is a Reading Recovery teacher. The difference between Reading Recovery and other ‘programs’ is that the teacher makes the difference NOT the consumables that one would purchase for any other program. So what is Reading Recovery ® as an Intervention then? “Reading Recovery is a highly effective short-term intervention of daily one-to-one lessons that supplement good classroom teaching for the lowest-achieving first graders. The goal is to dramatically reduce the number of first-grade children with extreme difficulty learning to read and write and to reduce the cost of these learners to educational systems. The emphasis is on prevention of literacy failure” (RRCNA, 2002, p.5). Reading Recovery was developed by a woman from New Zealand by the name of Marie Clay. It had been tested by numerous research projects in the 1970s and 1980s. The intervention is based on Marie Clay’s research that was focused on the “formative years of literacy learning” (RRCNA, 2002). 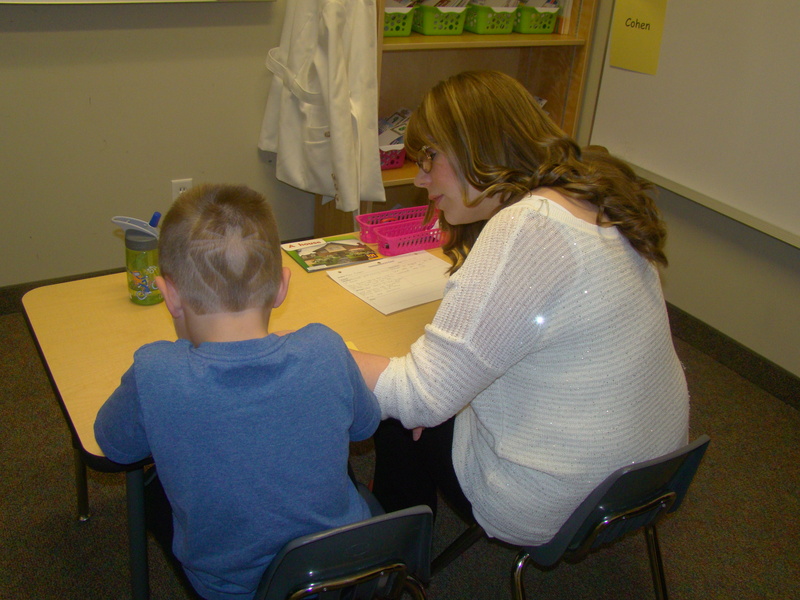 Marie studied literacy BEHAVIOURS of her young students as they “learned to read and write. “Her work led to what she called a literacy processing theory upon which Reading Recovery is based” (RRCNA, 2002). What does a lesson with the Reading Recovery teacher and student involve? Each lesson is 30 minutes long and the teacher is constantly observing and recording the BEHAVIOUR of the child. The teacher is making moment by moment decisions to support this student. This is effective in determining what to do NEXT with the child. Daily lessons run from 12—20 weeks depending on the progress of the child. This daily progress monitoring is RICH data for the RR teacher AND the classroom Teacher to use for the student. 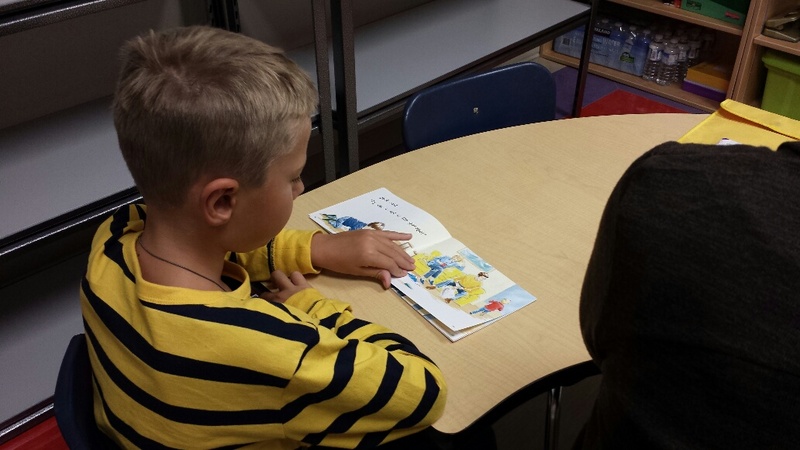 Who are the students that receive Reading Recovery®? “Reading Recovery is designed for children who are the lowest achievers in the class/age group. What is used is an inclusive definition. It has sometimes been argued to exclude this or that category of children or to save places for children who might seem to “benefit the most” but that is not using the full power ….. It has been one of the surprises of Reading Recovery® that all kinds of children with all kinds of difficulties can be included, can learn, and can reach average-band performance for their class in both reading and writing achievement” (Clay, 1991b, p. 60). With partial implementation (which we currently have in GPPSD) all of the above are considered when examining the “Tentative Selection List”. This is the list of students that have been recommended for RR at a school site and where all of the initial assessment information from the Observation Survey are recorded. Students are then selected from this information. What does Reading Recovery® tell us as a district? All teachers benefit from knowing how Reading Recovery works. There are strategies, Professional Development and Professional Learning Community implications that ALL teachers benefit from learning in RR. The strength in this intervention is in how teachers observe and change their teaching to suit the needs of the students they are working with. Another strength is in how teachers meet regularly to WATCH each other teach, ask questions about the strategies they are using, ask each other what they think they can change or adjust to assist their students to learn more effectively. The question is………… Why can’t we all do that? IMAGINE—where your students might go? Reading Recovery has been examined by many “high quality experimental and quasi-experimental studies as well as numerous qualitative studies. Research studies have been published in peer-reviewed journals or are peer reviewed conference presentations” (RRCNA website). Clay, M.M. (2006). Literacy lessons: designed for individuals, Pt 1. Portsmouth, NH: Heinemann Education. Welcome to post number two series of “What I Learned at the International Reading Association”. I have to be honest. Richard Allington can be brutal. What follows are some of those ‘Brutal but true’ statements that he has been claiming for years and backs up with a continuous flow of research. “We spend too much time on things that don’t work for some kids—if it is not working, CHANGE it”. If the kids are not getting it, it is NOT the kids it is what YOU ARE DOING. This isn’t new. If you have read any of John Hattie’s work, he says the same thing and bases it on his meta-analysis of many studies (Visible Learning: A Synthesis of Over 800 Meta-Analysis Relating to Achievement). “If the kids are not learning to read—it is because of us. We can’t change the parents. We can’t change their background experience. Someone has to decide what they are going to do to get kids learning,” Allington, Teaching Edge, IRA, 2013. Teachers who are explicit in their teaching of skills and strategies with students, have excellent results with student achievement. You have to know your kids. If you are continually monitoring their progress (not just your progress through the curriculum) and making the adjustments they need, kids will succeed. Dr. Allington explained to us how interesting it is that many kids who are placed in an intervention DO catch up. The most expert teachers can get them caught up in two years. HOWEVER, kids WILL slip back if in following years, they end up in a classroom where the instruction is focused to the middle of the group or is NOT explicit to the needs of the students. Allington says over and over again. Look to the research, NOT to the “program”. The strategies, and foundational research based learning structures are what we should be reading, studying up on and becoming expert in. EXPERTISE is where it is at!! There is overwhelming evidence that students who READ A LOT at their independent reading level are successful and have very few learning difficulties in higher grades. Are ALL your kids ACTUALLY reading during your reading block? During DEAR time? Do they have enough books at their level to read? If you make one simple change, ensure that EVERY student in your classroom has a lot of reading material at their reading level. At Their Level Means: they can comfortably decode and comprehend the text. They are engaged, and do not need assistance. They are reading between 97—99% accuracy. “Students who read below their independent level, do not improve as much or as fast as those who are reading a lot at their independent reading level” Allington, Teaching Edge, IRA 2013. Reads something they have selected. Will write something that is meaningful—to them. Will listen to a fluent adult read aloud. As a former Grade One teacher, Allington confirmed something for me. It is critical that Kindergarten and primary teachers (grades 1-3) know how to teach reading, know what the reading and writing behaviours are that they should be monitoring and guiding, and have the tools and strategies they need to use when working with students in small groups or one on one. I have to say the the International Reading Association is one of the best conferences that I have ever attended. It is here that you learn about and have confirmed, so many research based aspects of Literacy. There is so much I could share. So much I feel I need to share. With that in mind, I have condensed the highlights for me, into bullet form so that I could share as much as I can. …AND because there was so much I will include what I have learned in two posts. Here is the first of two!! visual inferentiation is very important. sketch to stretch – teach kids to sketch what they are visualizing as they read, label drawings, tell a buddy what they sketched and then do a quick write. word lists don’t work – the words have to be meaningful and kids need to talk about them. it is important to find the ‘right’ books for kids that are not ‘readers’. If you want HIGH school wide achievement, you need to embed the PD. Every teacher must be knowledgeable. Teachers and leaders must work together to improve student learning. It doesn’t matter the age, grade or level of the student, how we engage them. Support, length of time and topic are the only differences in our teaching based on the ages and abilities of the students. Guided reading is a check in. Based on what the child is doing and what he or she needs the child is doing most of the work. The teacher is only guiding. Reading programs do not teach comprehension. The teacher MUST know how to do this. If you stuck at the Recipe level – where you are following a program in a lock step manner, you and the students are in trouble. Kids need lots of books to read – classrooms should have up to 1500 books them for students to choose from. Public conferences – all kids learn as you celebrate a student’s writing. Giving really good feedback to kids is difficult to do. The person doing most of the talking is doing most of the learning. -The Gradual Release of Responsibility is not linear. There must be lots of modeling and lots of time for the students to practice their learning – guided and independent. Don’t OVER scaffold – this will lead to conformity and compliance. We want kids to dig in and do it for themselves. You must be thoughtful and purposeful in the teaching and learning time you spend with your students. Share the learning Target with your students. Are they clear on what that might be? If you are clear on what you need to teach them and what you want the students to do, think about what you have to teach EXPLICITLY. You WANT kids to experience the THRILL of figuring it out. How will you do that? You have to teach kids how to talk to each other. Stayed tune for highlights from Richard Allington!! I had the wonderful opportunity to witness and observe two coaches working together, learning from each other and improving in what they do. One of our district coaches is working on her Masters Mathematics. In one of the schools she is assigned to, she is sharing her new learning in the grade five classroom belonging to one of the school based coaches. What these two coaches have worked out with each other is so exciting!! The district coach models instructional strategies she is learning in her course work for the school based coach. During the lesson and while the students are involved in cooperative and hands-on learning, I witnessed the two coaches questioning with each other next moves, tweaks to the lesson, needs of the students, clarifications, and a true sense of collaboration and learning as the lesson unfolded. 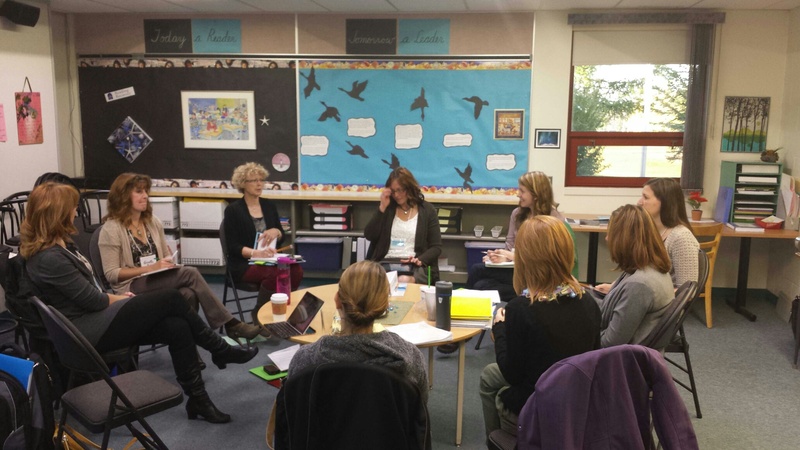 It was wonderful to see two teachers working together and learning from each other. In conversation with the school based coach, I learned how much she felt she was learning from observing another teacher who too, was learning. She explained how she felt more powerful working ‘with’ someone to assist student learning and achievement. She also shared with me how other teachers were ‘curious’ as to what was going on in her classroom and because of that, ‘enrollment’ was going up – others wanted to become involved in something like this. What was also very exciting, was not only were the teachers benefiting from this experience, the students were too. The modeling coach was using effective teaching strategies with the students. Because of this, ALL students could participate. They were participating in hands-on mathematical experiences that were tailored so that all students could comfortably and confidently participate. The students were motivated AND every one of the students were engaged……even the struggling little fella who had some self-esteem issues. These two coaches were modeling what good ‘teacher learning’ can look like.They were putting into practice strategies they were learning and there are TWO sets of eyes to see if it is working for the students. They were modeling for other teachers in the building on what good collaboration looks like. They were working together to get better at what they do. No working in isolation here! Two teachers who were enjoying working together and learning with each other ….. where it was VERY clear that ALL students were benefiting!! What is Balanced……. Literacy? What does it look like in your classroom? Does it look the same in every classroom? Is it something that only specific grades consider implementing? Why do we ‘do it’ in our School District? These questions among others come up every year in our district. They are good questions as they too, make me pause and ponder and dig, once again into my notes, research and readings on exactly what Balanced Literacy is…..so I can assist teachers in implementing it into their classrooms…..so I can assist my Instructional Coaches in supporting teachers. In my own words and based on ‘everything’ I have learned, balanced literacy is a framework for teaching literacy skills, ensuring that one’s students are supported in becoming successful, independent readers, writers and speakers. Within this framework and in consciously implementing the components of balanced literacy, a teacher guides students to be independent and literate through the gradual release of responsibility. Considering the components to this framework (Modeled reading/writing, Shared Reading/Writing, Guided Reading/Writing, Independent Reading/Writing) – you really are ‘balancing’ out what is necessary for students to become independent. Planning, using the balanced literacy framework ensures a literacy program is comprehensive. Implementing balanced literacy accounts for the diversity in the classroom. Balanced literacy assists a teacher in mindful teaching……..
…. teaching to the needs of students in the classroom. 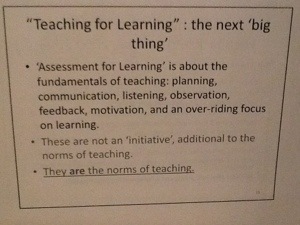 Knowing this, I ask myself and my teachers that I am working with……- why wouldn’t you want to consider this framework? When I was still in the classroom, I became very familiar with Balanced Literacy. It almost became a crutch for me, assisting me in my planning and ensuring I was considering all those important components necessary for good, core instruction. The framework, assisted me in creating my own ‘planning framework’ in which I was ‘plugging’ in all the necessary DAILY (and soon WEEKLY) literacy teaching, learning and discovering. I was reading to my students daily and would therefore be thoughtful in choosing the read aloud. We were participating in shared reading – daily, which meant, again, I was thoughtful in the poetry, stories or maybe even Readers Theatre Selections. Guided reading was happening daily, especially for my struggling learners….. and goodness!!! What I learned about my students in this daily practice!!! Independent reading was also happening daily- where studens had boxes full of books at their independent reading levels…. because I KNEW exactly where my students were reading independently. Writing was happening with purpose with lots of modeling, thinking aloud, guidance, small group work and sharing. Planning my literacy instruction using the Balanced Literacy Framework assisted me in ensuring I was ‘covering’ everything that is required in a comprehensive program. Implementing balanced literacy, I was acknowledging that not all students learn the same way and I was offering supports for those who needed it. I was able to intentionally be aware of ALL my learners in the way I was modeling, sharing and guiding. I wasn’t standing in front of the class explaining genre, telling how to write a paragraph or reading the book I enjoyed and then expecting my students to do the same. Balanced literacy can be the glue to create that BALANCE that our students need to gradually become successful and independent in their literacy skills……..
and it can be the best practice that enables us to be sure students who may then need to receive some form of intervention such as Reading Recovery are getting the ‘good classroom instruction’ that they REALLY need FIRST so we are SURE that they may need ‘more’. ……..and that is our job! A few weeks ago I had the privilege of attending the Alberta Assessment Consortium Fall Conference in Edmonton, Alberta. The keynote speaker was the wonderful Ruth Sutton. What a pleasure to listen to her speak about her years of experience and knowledge about assessment. For me, assessment has become a significant tool. It is not a final, punitive measure. It should be much more ‘friendly’ than that! It is a tool that teachers can use to assist them in meeting the needs of students, to move them forward, to provide us with the knowledge to change what must be changed in order to promote success among students. Assessment can help the teacher and the learner decide what must or could happen next. It should be something that happens minute by minute, day by day. This is formative assessment or assessment for learning. There needs to be much more of this…. then perhaps summative assessment won’t be such a ‘scary’ thing for teachers and students alike. Why scary? Students most often see ‘assessment’ as a judgement as to whether they ‘got it’ right or wrong. Teachers often see assessment as a judgement as well, determining whether the kids got it or not. Assessment is way more than that…….and Ruth reinforced that for me. What follows are a few of the ‘reinforcing’ highlights. When we think about our students we must consider: What does it mean to be safe, healthy, kind, resourceful, to survive and to grow into an adult? We have an obligation to help students understand they have choices…they CAN make the right choices in becoming a kind, healthy, resourceful adult. With that in mind, how do we know what they have learned? AND what are we going to do about it? This is Ruth’s landscape to begin ‘work’……. doesn’t that make sense? Think: How does assessment influence your teaching? Remember!! Testing alone does not improve learning. The difference between formative and summative is what you do with it! We must involve the student. This is not always ‘fun’ or ‘easy’…….. but it works. The student needs to see the criteria. If they can see the purpose it makes more sense to them. Our sole purpose as teachers is to maximize learning. Feedback for students needs to be specific, respectful, timely and connected to the criteria established. It must be clear, immediate and consistent. Sometimes we can’t go with the ‘plan’. We have to go with where the kids are coming from. We can’t assume they come to us knowing what we want them to learn so we can go neatly into ‘our curriculum’. Activities, tips and tricks are great BUT you have to have the DEEP PERCEPTION of how learning happens. Below is a handout that Ruth shared with us. The wording in these 5 Principles are critical. They are deliberate. Planning is very important in order to get the assessment piece right. Planning is the mechanism for change. Teaching, Planning and Assessing is HARD work…..sometimes going there is too hard and teachers get turned off…..but we have to do it. It is our obligation. 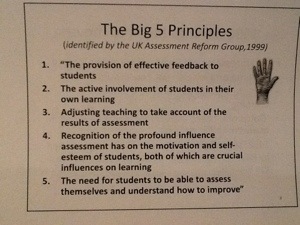 Ruth challenges us – don’t let the word “Assessment” interfere with what we REALLY need to do…. and that is maximize learning. Can your students articulate their learning? Can your students tell you where they are going with their learning? Can your students tell you what they can do to improve their understanding? Can they tell you with certainty that they ‘have it’? Can you tell with certainty that your students ‘get it’? Choosing Not To Learn is Not A Choice If You Are A Teacher…..
Jim Knight verbalized something that I have been thinking about for awhile now. “Choosing not to learn is not a choice if you are a teacher. You chose to be a professional. You chose to join the ranks of making a committment to be bigger than yourself. You are committed to students first. We are taking part in the molding of young lives. Have we thought about the effect we really have on these young people? Are we as prepared as we should be ….to be working with the best the parents have to send us? Each life we are touching is a different being who has interests, strengths, and talents that are unique to that child. We really don’t have a choice! and to help them succeed.